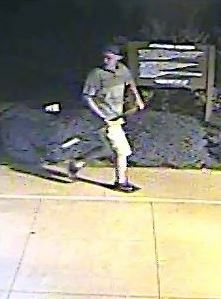 Killeen Police need the citizens’ help by identifying a suspect who vandalized property at the Central Texas Veterans Cemetery. 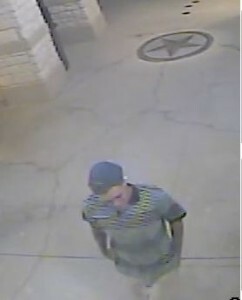 Detectives received information that a white male entered the cemetery located at 11463 US HWY 190, between 5:30pm on Friday, October 31, 2014 and 8:30am on Saturday, November 1, 2014. The suspect smashed the screen to the kiosk used to locate headstones and the glass doors on a bulletin board, using a T-post. 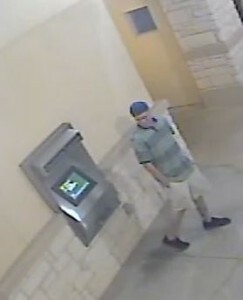 The suspect is described as a white male wearing a dark blue cap with an unknown design, a gray shirt with dark horizontal stripes and a black collar, khaki shorts and black shoes.